Then he made the disciples get into the boat and precede him to the other side, while he dismissed the crowds. After doing so, he went up on the mountain by himself to pray. When it was evening he was there alone. Meanwhile the boat, already a few miles offshore, was being tossed about by the waves, for the wind was against it. During the fourth watch of the night, he came toward them, walking on the Sea. When the disciples saw him walking on the sea they were terrified. "It is a ghost," they said, and they cried out in fear. At once (Jesus) spoke to them, "Take courage, it is I; do not be afraid." Peter said to him in reply, "Lord, if it you, command me to come to you on the water." He said, "Come." Peter got out of the boat and began to walk on the water toward Jesus. But when he saw how (strong) the wind was he became frightened; and, beginning to sink, he cried out, "Lord, save me!" Immediately Jesus stretched out his hand and caught him, and said to him, "O you of little faith, why did you doubt?" After they got into the boat, the wind died down. Those who were in the boat did him homage, saying, "Truly, you are the Son of God. "You may have heard of a man named Jerry who was walking along the side of a giant cliff. At one point, he took a bad step and went flying over the edge of the cliff headfirst towards certain death. As he was falling, he grabbed out for anything he could get his hands onto and providentially caught a limb of a tree growing out of the side of the cliff. After dangling in midair for a few seconds, he cried out, "Is there anyone up there? Help me! Help!" Silence. Suddenly, a voice from heaven speaks out, "Jerry, this is God. I will help you." Jerry replies, "Great, you can do anything. What do I need to do?" God replies, "Let go." Jerry then says, "Is there anyone else up there?" As trite as this story may be, it calls to mind some of the prevalent themes of today's Gospel: fear, courage, faith, hope, and love. It is important to recall the context of today's Gospel. This event of the walking on the water takes place immediately after the feeding of the 5,000, which was last week's Gospel. You'll recall in last week's Gospel how Christ wanted to get away from the crowds and His work after learning about the death of John the Baptist. And, as quickly as He tried to get away, He is pursued by the crowds and so He cured their sick and fed the multitudes. Today, we hear about how our Lord, after having fed the multitudes, finally gets a free moment to pray and so He sends the disciples in a boat to the other side. Church scholars tell us that we ought not overlook the significance of the disciples decision to get in the boat and go to the other side. Jews had been fishing and boating the waters of the Holy Land for centuries and they could tell when storms were coming. In fact, storms just don't pop-up on these waters. The Jews had something better than Doppler Radar. Scholars tell us that when Jesus sent them out onto the water, they knew that trouble lurked. Hence, their act of blind faith is worth noting. For ourselves, we have all experienced times when we have had to trust God completely, almost blindly, when at the time, things did not seem like they were going to work out. Hindsight shows that God knew what He was doing all along, even at the time, it did not seem that way. And so it is true with the disciples who get into the boat - they know that trouble lies ahead and yet they go forward in beautiful trust of Jesus. The storm that kicks up over the water represents all of our sufferings, trials, illnesses and difficulties in life. When Jesus comes across the water, symbolizing how he Himself transcends and can overcome all of this world's concerns and problems, we notice that there are two types of fear at work. The first type of fear is the fear of the disciples who think that Jesus is a ghost. The second type of fear is Peter's fear that causes him to sink into the water. First, we should consider the fear of the disciples who think that Jesus is a ghost. The disciples don't recognize who Jesus is and when they see him, they are fearful. They are not as afraid of the elements or the storm - they are afraid of Jesus. Can people be afraid of Jesus? You bet. When the Lord asks us to do something for Him and when He asks us to make certain kinds of sacrifices for Him, we can grow afraid of what that will cost us. People can be fearful that growing "too close" to Jesus will cause them to change the way they live and experience conversion. It's a scary proposition for many people. Consider the couple in their mid to late 30s who has had several children. At first, they were very faithful to the Church's teachings against the use of contraception in their marriage. Now, however, things are different. They want total control over their lives and they are afraid that following Jesus and trusting Him will mean another child in their marriage. And so, they turn to contraceptives of some type in order to retain some semblance of control over their lives. How often do we hear that others have "control issues." We don't want to let go and let God be God because that is risky. And yet, we know that deep faith and hope demands as much. Indeed, people can become very afraid of Jesus. They would rather be in control than allow Jesus to have dominion over them. Peter's fear is the second type of fear operative in our Gospel today. Peter does not fear Jesus. In fact, he even addresses Him by asking our Lord to command him out over the water. When Peter has his eyes set on Jesus, he can walk on water, but when he begins to be distracted and overwhelmed by the elements, by the weather or by what seems like insurmountable odds, he sinks. 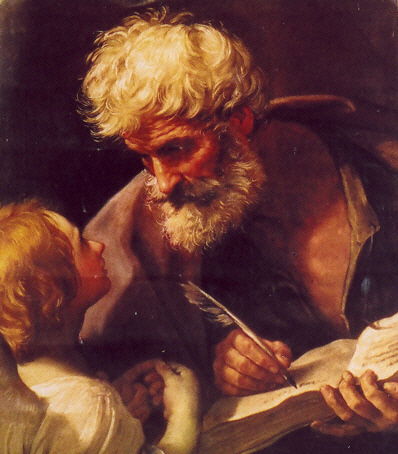 We, too, can be as fearful as Peter and loose our focus on the Lord. Think of the teenager or college student who really wants to be chaste and modest and sober and clean - they can be the subject of ridicule by peers. Like Peter, they can lose heart and begin to sink. Think of the office worker who is afraid to speak up at work to defend the Faith or stand up for sound Catholic moral principles for fear that they may not get that bonus or worse yet, a negative performance evaluation. We can sink when we lose our focus on the Lord and begin to trust in the world's capacity to overwhelm us instead of trusting that Jesus can walk on the water and that He will take good care of us. The final dynamic at work here is when Jesus pulls Peter out of the water. 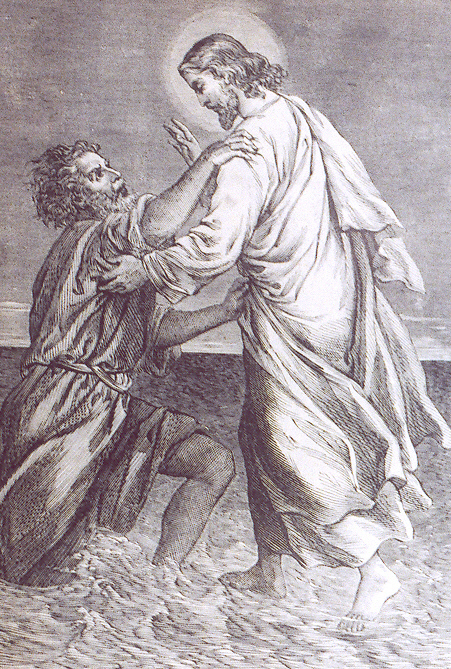 Jesus rebukes Peter for his lack of faith but He does not leave Peter to fend for himself. When Peter begins to sink, Jesus does not cry out, "swim!" Rather, he pulls Peter our of the water, yes - with a rebuke, but He saves him. This means that God is never outdone in generosity. If we are willing to take the risk of trusting Jesus more completely, He will always award that trust. He never abandons us but remains constant in His dedication to us. To close, let us recall the first words that John Paul II enunciated in October, 1978, when he became our Pope. What did he say? He simply exclaimed, "Be not Afraid!" And for nearly the next three decades, he would remind us of the words spoken to Peter by Jesus - words that have significance for us in our own time. We need not fear the world and its pressures; we need not fear living evangelically and zealously for the faith; we need not fear becoming holy. Finally, we need never fear Jesus, whom the disciples adored after He got into the boat with them. As He was then, He is so close to us now, especially as He waits for our love from the tabernacle. Let us pray to put away our fears and have genuine fortitude - that courage that is persevering and enduring, not merely valor-like courage needed in battle, but a long-lasting courage that bears sufferings patiently and with great love. Like Peter, we can walk on the water, if only we will trust completely and allow Jesus to work wonders in our lives.